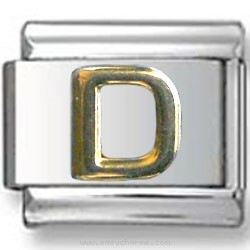 Add this beautiful gold enamel Letter D Italian Charm to your bracelet. Express yourself by putting on the bracelet names and words that are in you heart. This gorgeous letter D charm can be perfect part of those words and your bracelet.